The Cambro 100MPC131 Camcarrier® insulated food pan carrier can safely hold hot or cold food near its starting temperature for up to four hours. This carrier can hold full-size pans, 1⁄2 size pans, and 1⁄3 size pans. 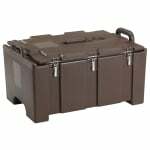 Its polyethylene construction is durable and scratch resistant but is lightweight and has molded-in handles for easy transportation. The carrier is dishwasher safe for an easy cleaning process. The polyurethane insulation and removable gasket help retain hot or cold food temperatures. A passive vent slot on the underside of the lid allows the release of pressure when holding hot food. If you use more than one carrier, they stack together to make moving and storing easier. The Cambro 100MPC131 Camcarrier® insulated, top-loading food pan carrier comes in Dark Brown.